The stately palm trees that welcome people into the Valley along I-69E/U.S. 77 in northern Willacy County are going to be moved. 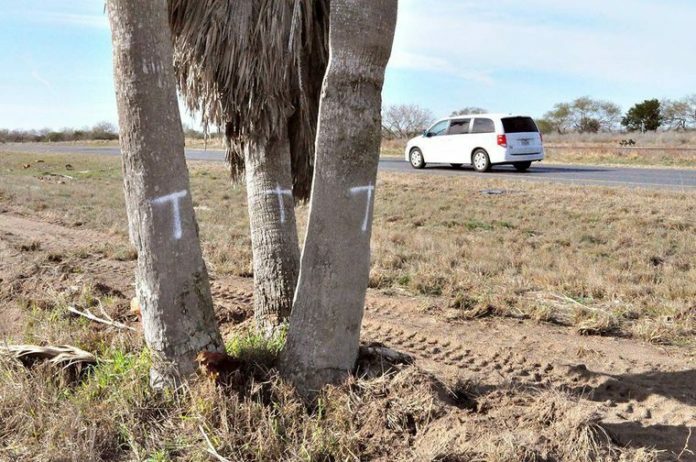 To make sure I-69E conforms to federal highway regulations for interstates, the trees with the "T" spray-painted on them are going to be uprooted and transplanted to other TxDOT rights-of-way. HARLINGEN — As issues go, opinion is definitely swaying in favor of the trees. TxDOT’s announcement 11 days ago that construction along I-69E/U.S. 77 in northern Willacy County will mean the removal of hundreds of stately palm trees has energized a resistance in the Rio Grande Valley. A petition at www.change.org has received around 35,000 signatures to stop the removal of the trees, even though TxDOT says it will transplant 273 of the healthiest palms to the interstate median in Raymondville. “I-69E/US 77 Palm trees have been an iconic part of the Rio Grande Valley welcoming locals back home and bringing memories to those who have left home to pursue higher education, a career or create families of their own,” the petition reads. The $22.7 million project began last month from Business 77 in Raymondville to just under a mile from the Kenedy/Willacy county line, where crews are improving freeway main lanes, frontage roads, entrance/exit ramps and wildlife crossings. The project also includes culverts, storm sewers and drainage structures, bridges, retaining walls and eventually new lighting. “I, like everyone, love the palm trees on I-69 East. They were placed there in the late 1970s or early 1980s through the hard work of many civic-minded leaders,” state Rep. Rene Oliveira (D-Brownsville) said in a statement. Oliveira said he has been monitoring the online petition, and that a handful of people have emailed or called his office directly on the issue. In addition to Oliveira, the petition drive also is seeking to enlist the help of U.S. Reps. Filemon Vela (D-Brownsville) and Blake Farenthold (R-Corpus Christi), and State Sen. Eddie Lucio Jr. (D-Brownsville). A spokesperson in the office of Congressman Vela in Washington said they were aware of the controversy and were looking into the issue. A staffer in the office of Rep. Blake Farenthold in Washington said no one in the office was authorized to speak on the issue. At Lucio’s office, staffers said he was out-of-pocket Friday but was well aware of the issue and the passion among Valley residents it has aroused. Members of Oliveira’s staff, meanwhile, noted that whether to proceed with the construction activity, which has now begun, was decided six or seven years ago following numerous public hearings and a media advertising campaign. Environmental studies were completed and reviewed by TxDOT prior to approval and the awarding of the construction contract. Interstate 69 consists of a half-dozen disjointed pieces which begin in Port Huron, Michigan, and run all the way to Texas and the border. While the signage says “I-69” here in Texas and elsewhere, the interstate is miles away from being finished. The construction in northern Willacy County is part of a plan to bring the eventual 1,700-mile NAFTA Superhighway into compliance with rules regulating federal interstates for safety and other issues. “The Valley has seen explosive growth, and with that growth has come more traffic,” Oliveira said. “To keep people safe, now and into the future, we need to expand I-69 East from four lanes to eight lanes. Oliveira said once the current highway work is finished, he is prepared to meet with local civic and environmental leaders to fashion a new beautification project to welcome travelers to the Valley as scenically as the palms have done for 40 years. “I am confident we can develop an equally iconic look for the Valley’s front door,” he said.